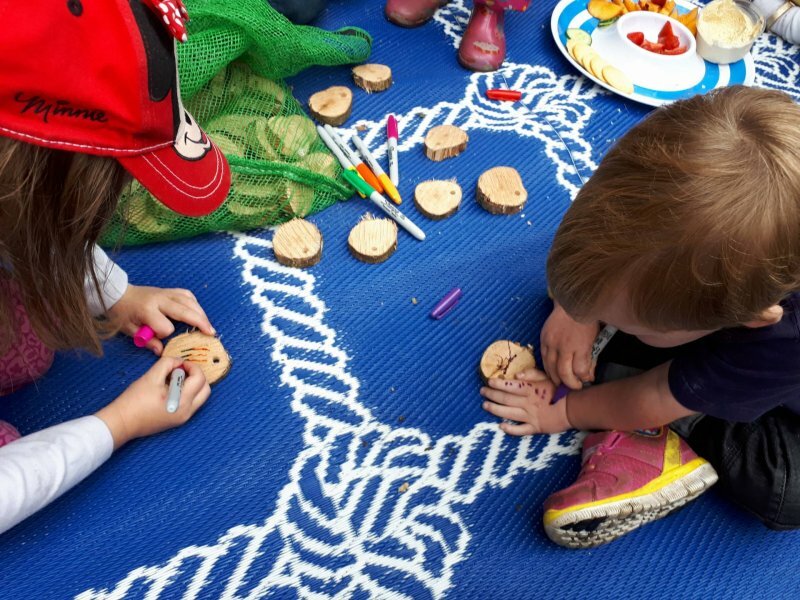 Forest school, or outdoor schools and groups are becoming ever more popular now, with child centred led play and encouraging free thinking at the heart. They can range from independent schools to after school clubs, pre-schools and weekend experience days. The ethos is all the same. 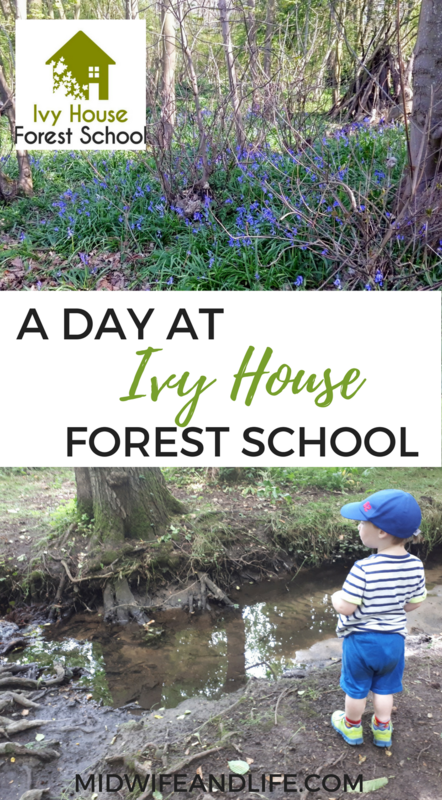 Ivy House Forest School is based in Maidstone Kent and is aimed predominantly at 3-5 year olds. At the moment they’re offering weekend sessions with the hope to expand into a pre-school setting next year with some after school groups. Samantha runs it from her home setting, which is smack bang in the forest, and her large rolling garden provides the base. 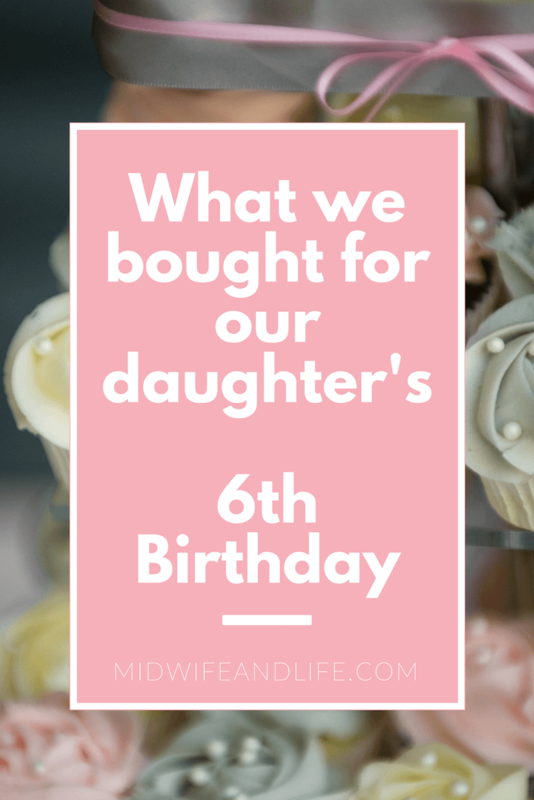 Your child will need clothes that won’t mind getting dirty and full waterproofs and wellies are a must. Come with a change of clothes. 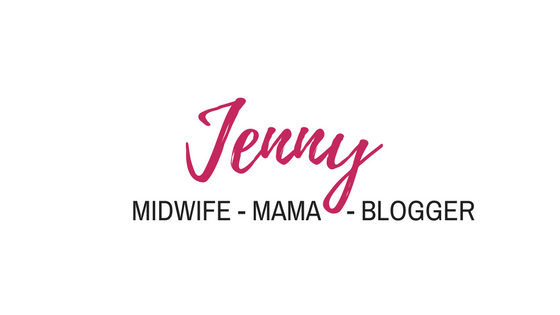 You will need to read and sign a waiver before you leave your child. 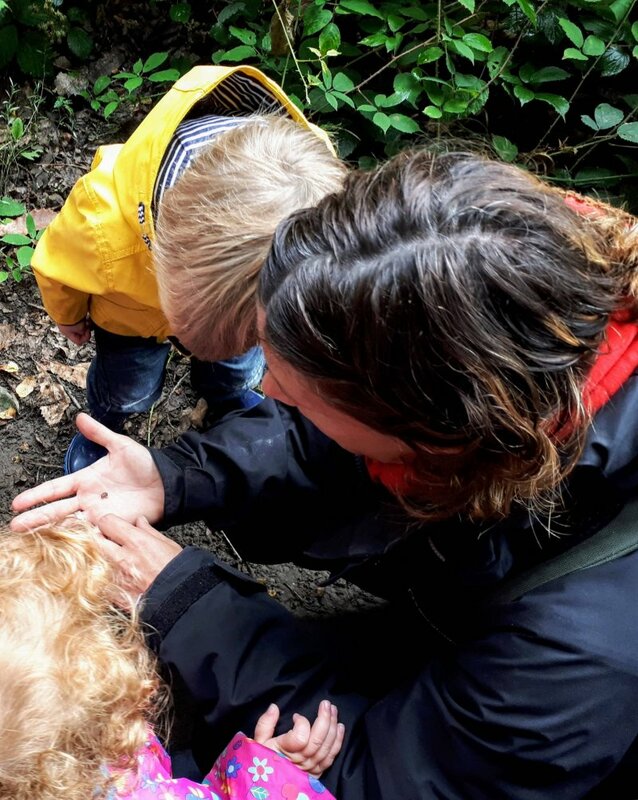 What’s involved in Forest School? 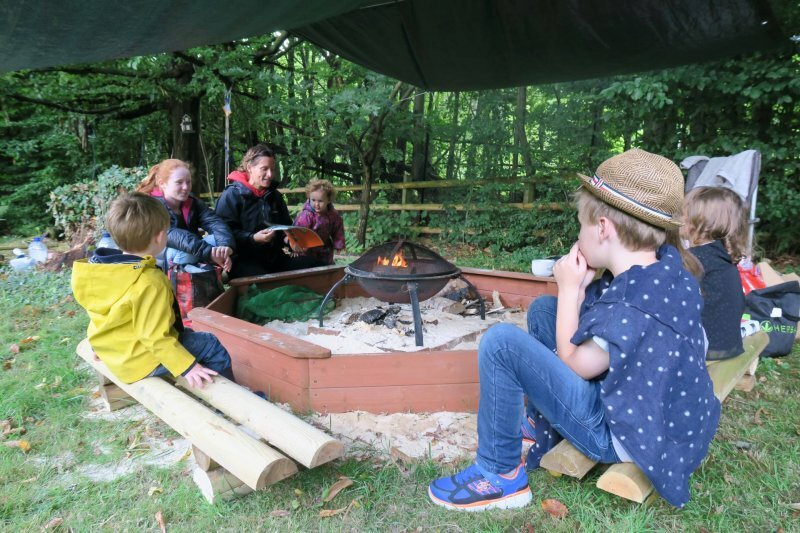 Once we’d arrived and settled in, the children were free playing – there’s a mud kitchen, a pallet swing and a fire with seating around it. The kids are taught about fire safety and moving away from the smoke if they need to. Once they were settled, Sam sat them down and told them a story which linked in with the day. She got them all involved in the story telling. Then we all got ready and went off into the forest. We looked at bugs on the way, and searched for fairies. Our destination was the stream a little way into the forest. Once we got to the stream, we set up a camp flag and they were allowed to paddle in the stream, make mud pies, worm houses and play in the forest. My eldest boy (8) enjoyed himself, but he doesn’t really like getting muddy. Phoebe, who’s 6 liked making worm houses and playing with the other children. 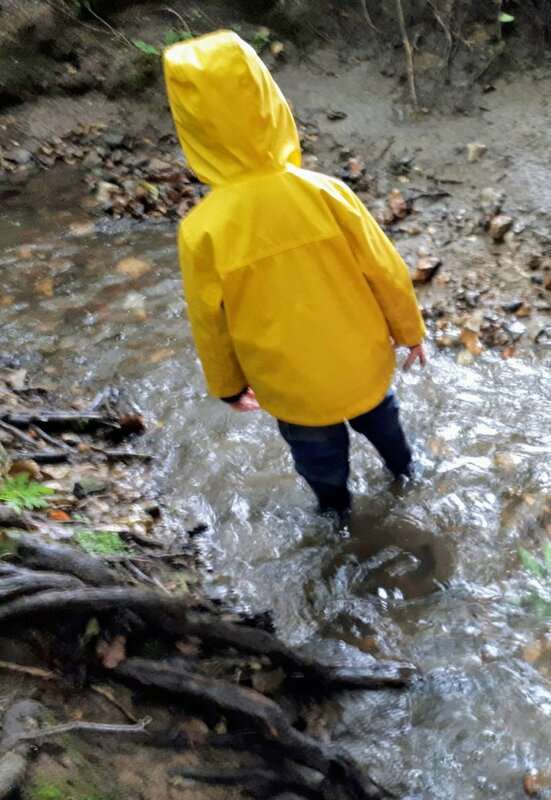 Daniel (2) got stuck in to the stream, I was following him around with wellies that had a hole in (not ideal) and I’d forgotten the above advice so he had no waterproofs or change of clothes! He did end up sitting in the water and he wasn’t too impressed after that. If I’d been more prepared it would have gone better. He was really enjoying himself up to that point though, it was really hard to get a non blurry photo! So a little soggy and one mud slide later we trooped back for marshmallows on sticks and snack time. The children were invigorated and had learnt something by the end of the session, I will definitely be going back. We also made wooden tokens that the kids customised themselves. 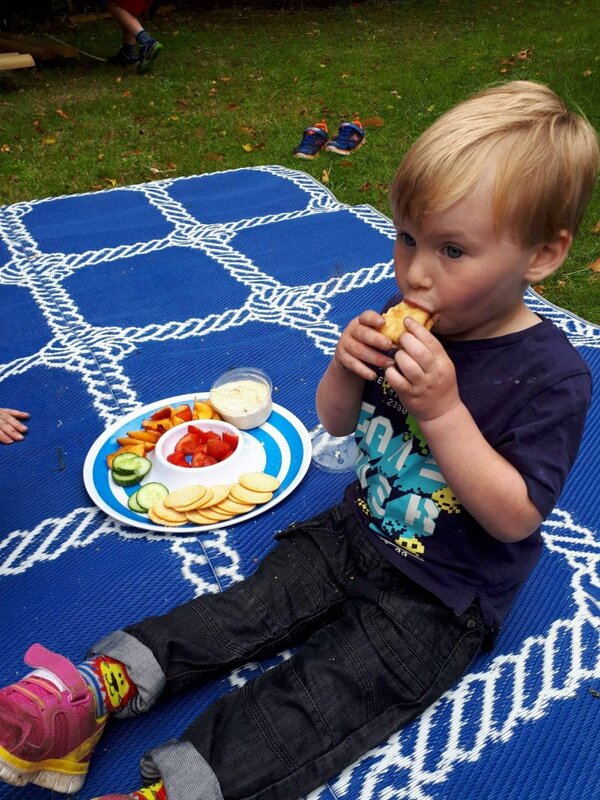 It’s all outdoors of course, and if it rains there is a tent erected to shelter in, but the whole point is being aware of the changes in seasons and exploring nature in all weathers. 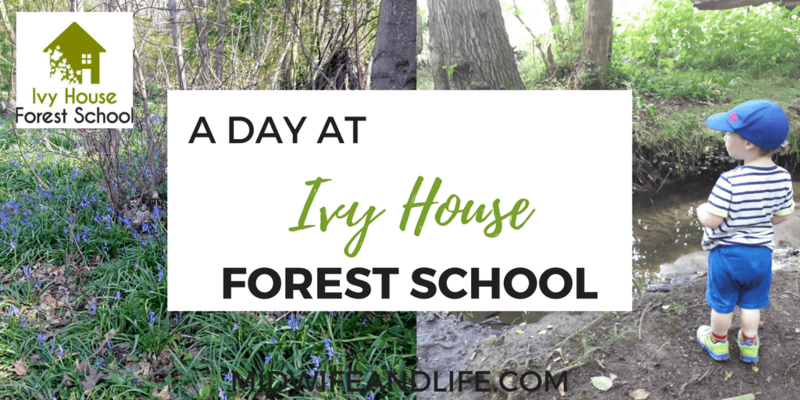 If you’d like to get in touch about a forest school session, you can contact Ivy House Forest School on Facebook. Disclosure: we attended the session at no cost for the purposes of this review. All opinions my own.